Former Fort Saskatchewan Trader Matt Frattin has officially bounced back from some tough times. 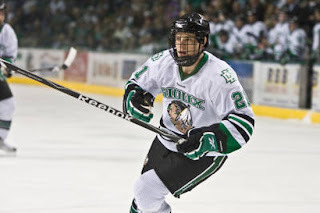 Today Frattin, a North Dakota Fighting Sioux forward was named one of the 3 finalists for the Hobey Baker award, given out to the NCAA's most outstanding player. News earlier today from the Oilers (via Oklahoma City) that Acadie-Bathurst netminder Olivier Roy has signed a 3-year entry level contract with Edmonton. The news hit Twitter earlier in the day when Barons beat writer Ryan Aber first reported it. The Pipeline Show is excited to be able to bring you some bonus content from our new friends at PuckLife. From time to time, we'll be posting player profiles written by some of PuckLife's scribes but that still fit the format of what we do here at Coming Down the Pipe and on the air with TPS. If you enjoy what you read here by PuckLife, we'd recommend that you give them a closer look by going here. You'll also see a banner for the publication down the right hand side of our page. Tuesday night we welcomed the top rated goalie (by NHL central scouting) for the NHL draft, a GM fresh off firing his head coach, a Commissioner turned head coach and our CHL insider with news of the Chilliwack Bruins potential sale and relocation. Tonight we'll find out from Seattle G.M. 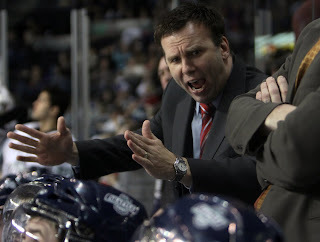 Russ Farwell why he made his coaching change today, and what the TBirds need to do in order to get back into the WHL post season. 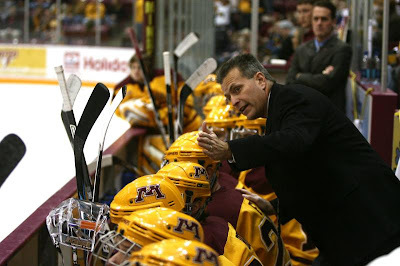 We'll also speak with new Michigan State University head coach Tom Anastos about leaving his post as Commish of the CCHA to become a head coach, and what the new Big Ten Hockey Conference will do for College hockey. The top ranked goaltender according to NHL Central Scouting is John Gibson of the U.S. National Development team. He'll try and lead the States to another gold medal at the U18 World Championship next month. Guy and I will debate on who the best player in the WHL is right now...Ryan Johanssen of Portland or Brayden Schenn of Saskatoon, as well as what we think is the best story line in the WHL post season right now. And our CHL insider Sam Cosentino will fill us in on what the big stories are in the OHL and QMJHL. 7-9 pm mst on the TEAM 1260 in Edmonton or online here. 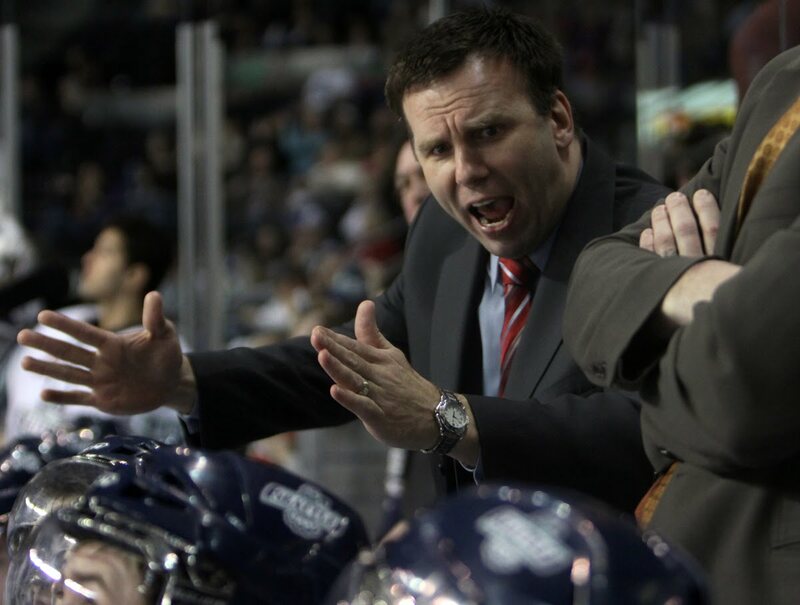 As TPS eluded to last night, the Seattle Thunderbirds have made a move behind the bench, electing to not renew Head Coach Rob Sumner. Here's is the full release with quotes from TBird GM Russ Farwell. We also wrote about WHL teams relocating/being sold last night. One of the scenarios that was passed onto us was Chilliwack being sold and moving to Victoria and Prince George heading to Chilliwack. According to Cougars G.M. Dallas Thompson, the team has 8 more years left on it's deal in PG, and another source told us that while there is an out clause, it's ridiculously hard for the team to use it. At Rexall Place tonight for game 3 between Red Deer and Edmonton there were more then 23 NHL scouts/G.M's representing 12 different NHL teams as well as various scouting agency's and WHL personell. Needless to say it was a good place to pick up some information, and here are some things that were passed our way tonight. Is the WHL moving back to the Island? Jim Mullin reported recently that the Chilliwack Bruins were fielding offers from a group in Victoria, and could be on the move. TPS received an email tonight stating that a deal was done. We reached out to different people in the league to try and find out more, and received several 'no comments' but noone flat out said it wasn't happening. Another source passed on that if Chilliwack does move to the Island, then Prince George might have an interest in shuffling off to Chilliwack. A well placed source told us the league very much wants to have two more clubs in the Western Conference to make it an even dozen just like the east. Nanaimo has also been long rumoured as a possible destination. The QMJHL was busy handing out suspensions late Friday/early Saturday as an unlucky 7 were sat for Saturday games and beyond. The official release is here. I haven't seen any video of the hits, punches or slew foots so I can't say whether or not their deserving suspensions or an over reaction. If the hits are as dangerous as the ones we are seeing in the NHL lately then good on the league for reacting quickly and somewhat severely. Sitting a guy in the playoffs has an almost 3-1 ratio to regular season games in some hockey peoples eyes. This morning Guy and I recapped every CHL and NCAA playoff game, went in depth with 3 different CHL series and a bracket of the NCAA tournament and discussed concussions and why one NHL rookie has the most impressive stats in the Calder trophy race. Click here to go inside the world of prospects hockey. Montreal and Rimouski met near the end of the QMJHL season and fed up with the way the Juniors play the trap, Rimouski made 16 passes in their own end before firing it down the ice. It's one of the funniest things I've seen in a long time. Game one between Edmonton and Red Deer started off where the last two games left off. Just seconds in It was captain on captain when Red Deer's Colin Archer tried to cream Oil King blueliner Mark Pysyk. The Buffalo Sabre draft pick just got out of the way and avoided most of the hit. Things continued at the other end when Darcy Kuemper gave TJ Foster a face full of leather, drawing a scrum and giving Edmonton their first power play. Laury Ryan stepped down as SJHL president today, but according to some it was only a matter of time. Word is Ryan didn't receive a vote of confidence in each of the past 2 seasons and there was a movement afoot to replace him. 'They're 4th among the 4 western league's' one source told TPS referring to where the SJHL ranks among junior A loops from Manitoba to BC. TPS has learned that Swift Current Broncos forward Justin Dowling is in the sights of the Calgary Flames and in fact, may have already signed a contract with the NHL club. 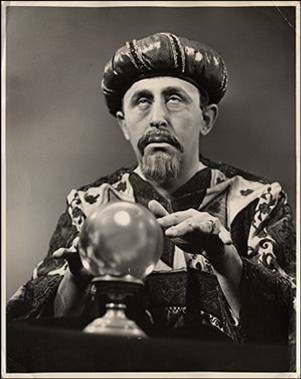 I have not yet been able to confirm that a deal is done but it sounds to be close at the very least. It is possible that this will not be the standard 3-year entry level deal but instead a minor league agreement for a year or two. [It has now been confirmed that Dowling has signed an ATO and will head to AHL Abbotsford]. 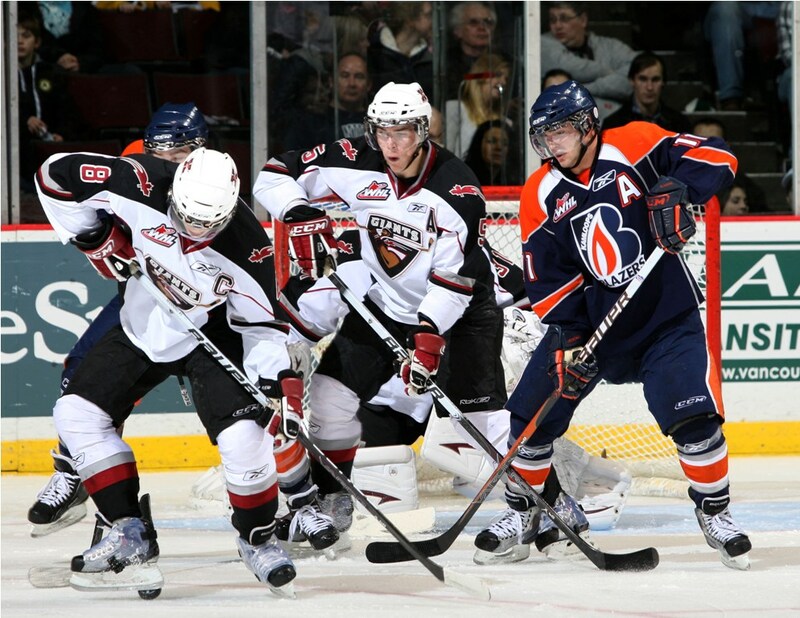 The Red Deer Rebels announced today they will make a bid for the 2013 Mastercard Memorial Cup. As a guy who covered the Rebels from 2000-2002 I can say the Enmax Centrium would be a great place to host the event, and Red Deer hockey fans will be all over it. Here's some of the news release put out by the team. 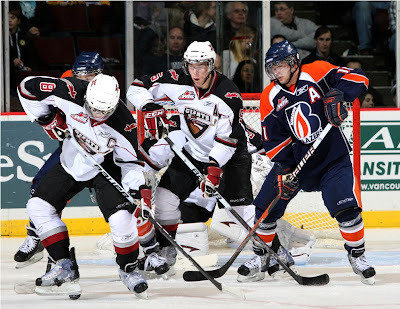 If five or more cities bid for the 2013 Mastercard Memorial Cup, then the WHL will review preliminary bid information and shortlist the bids to a maximum of four by June 15, 2011. 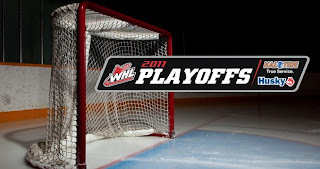 The presentations to the WHL Board of Governors will be made October 15, 2011. The final decision will also be made that day. More details about the Red Deer bid, and its committee, will be released at a later date. THe WHL Bantam Draft lottery was held this morning and was won by the Kamloops Blazers who move up a couple of spots and will now select 4th. It didn't change the results at the top though as the 1st overall selection will still be made by Brad Whelen and the Calgary Hitmen. Complete order for the non-playoff teams: Calgary, Swift Current, Regina (pick held by 'Canes), Kamloops, Lethbridge and Seattle. I received a text today that suggests something pretty surprising. It said that Tom Anastos, Commissioner of the CCHA Conference, is leaving that post to become the new head coach at Michigan State. The Spartans position is currently vacant after the (forced?) retirement of Rick Comley. 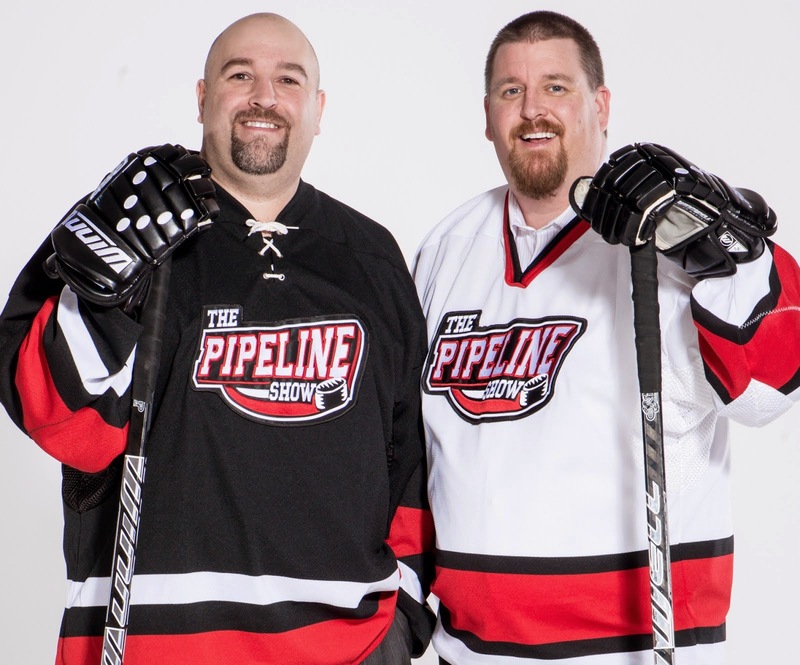 Tuesday night was Prediction Night on The Pipeline Show as we went through all three CHL leagues as well as the NCAA National Tournament bracket with our no holds barred predictions. Joining us for each segment was another TPS regular who closely follows the league in question and not surprisingly, each of them contributed tidbits that we'd overlooked. How'd we do? More importantly, do you agree with us? Click, find out and then let us know. Part one of this series came out last week with an in-depth report of how the scouting community views Oil Kings forward Dylan Wruck. 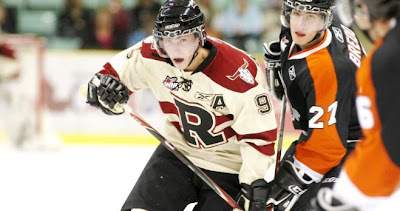 Continuing the "Pickin' Brains" series, this week I'm revealing the results of the informal poll of scouts when asked to name the top WHL blueliner available in the Class of 2011. It was a fairly simple question but I was very surprised by the results of the straw poll. My expectations were that one player would be the clear favourite but that another would get a vote or two. What actually came my way had me shaking my head. 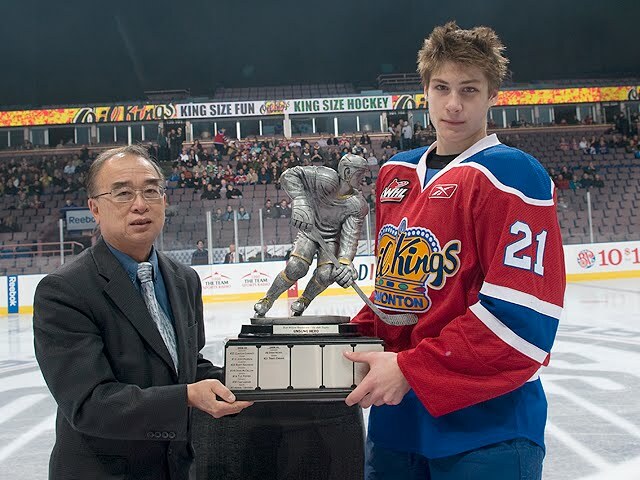 Question #2: Of the WHL defencemen eligible for the 2011 NHL Draft, who is at the top of your own personal list? 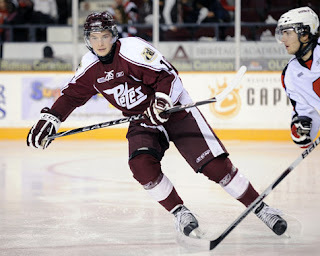 The Pipeline Show received an update on the status of key 2011 eligible prospect Matt Puempel of the Peterborough Petes. The forward has been sidelined since February 21st but still finished the season as the club's top scorer with 69 points. The 6', 190 lb left winger is Peterbough's nominee for the Red Tilson Trophy which goes to the OHL's most outstanding player. 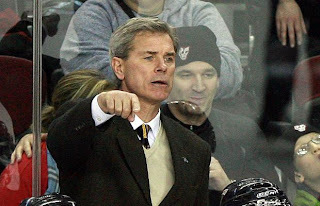 Holland Commits To MSU: Big Ten Here We Go-updated WHL reaction. Okotoks Oilers blueliner Rhett Holland is heading to Michigan State University for next season. Holland is a 6.01, 212 pound defenceman from Calgary, who's team is in the AJHL South Division final right now with the RBC host Camrose Kodiaks. However Holland isn't playing as he's been out since mid January with an upper body injury. 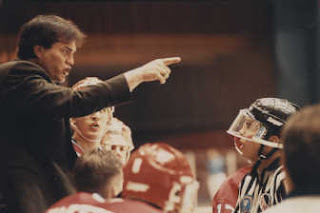 TPS has learned that Calgary Hitmen bench boss Mike Williamson will be named Canada's Head Coach for the upcoming Under 18 World Championship. Joining him will be a former Oiler and Winnipeg Jet in current Swift Current and Barrie Colt Head Coaches Mark Lamb and Dale Hawerchuk. An announcement will be made on Wednesday. After the Conference playoffs, some number crunching and calculator button mashing, the NCAA National Tournament bracket has been officially announced. 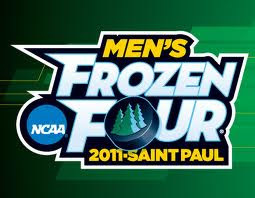 As usual, there are going to be some fantastic match ups in the four Regionals and the potential for a very compelling Frozen Four still exists, although not the four teams I was hoping for. After the click, some thoughts on the brackets and the match ups. 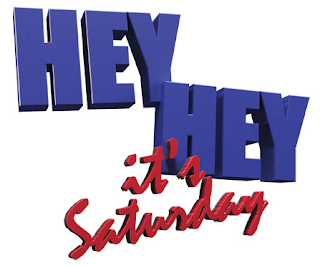 Saturday on The Pipeline Show Dean and I spoke with an assortment of guests that cover a wide spectrum of the hockey world. We talked Major Junior, NCAA, AHL, NHL, the NHL Draft and more. In other words, more of what you've come to expect when you tune in to The Pipeline Show. Remember the final scene in Youngblood where Racki and Dean Youngblood square off and start the fight by jabbing at one another with their sticks? Of course you do, it's the greatest hockey movie ever made. What happened in the MJHL on March 12th isn't really as bad as the ending to Youngblood (really? Youngblood is allowed to hit Racki in the head with his stick while everyone including Hanna the ref stands around watching and cheering?) but it's still hard to believe and bad news for the MJHL. It's not yet confirmed by the Oilers or the Barons but TPS has learned that the Edmonton Oilers have recalled Ryan O'Marra, Chris VandeVelde and Alex Giroux and that all three will be in the line up on Thursday night. The trio arrived in Edmonton just after midnight after playing in Grand Rapids on Wednesday evening. O'Marra collected 3 points in 9 games with the Oilers earlier this year, Giroux's recent stint in the NHL saw him pick up 2 points in 5 games. This will be the NHL debut for VandeVelde (above). The former member North Dakota Fighting Sioux center has 12 goals and 16 points with Oklahoma City this year. There has been a lot of speculation about the future of Minnesota Golden Gopher Head Coach Don Lucia. The Gophers will be spectators at the National Championship for a 3rd straight year and after getting swept by Alaska-Anchorage, they will also miss the WCHA Final Five for a second straight season. So what's next for Lucia? Is Brian Maxwell Coming Back To the WHL? The man who guided the Spokane Chiefs to the 1991 Memorial Cup could be returning to the WHL. Sources have told TPS that Bryan Maxwell has met with the Vancouver Giants about a "hockey job" meaning he could be returning to a bench soon. 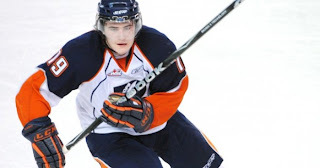 The WHL finally decided on the appropriate length of suspension for Kamloops forward Brendan Ranford after his game misconduct back on March 11th. The Blazers will be without their leading scorer for the rest of the regular season and the start of the playoffs as he's been handed a 6-game suspension for abuse of an official. Red Deer Rebels forward Ryan Nugent-Hopkins is bringing it right now. The WHL POW has March Madness with 15 points in 6 games this month. He's racked up 2 hat tricks, a 5 and 4 point game, and he reached the century mark over the weekend. The highest ranked WHL player for the NHL draft has 102 points and sits tied for 3rd in league scoring. RNH has more assists (74) this year than he had points (65) last season. WHL Western Conference Playoffs - Who Wants In? There are 4 teams still looking to clinch a spot in the WHL's Western Conference; Prince George is in 7th with 66 points followed immediately by Everett with 66. Currently on the outside looking in are the Kamloops Blazers with 63 points and Seattle with 61. The T-Birds have the biggest hill to climb as they'll need to run the table and hope the clubs ahead of them all fail to pick up points. That won't happen though because, although PG and Kamloops each only have two games left, they are against each other so points are guaranteed. It's become a bit of a snail race though as the four teams have combined to win just 15 of their last 40 games, Seattle has 6 of those victories. Over the last month or so I've been contacting a number of scouts in order to get a strong gauge on how they feel about a few different players and groups of players in the Class of 2011. "Pickin' Brains" I call it. I believe that TSN analyst Bob McKenzie's rankings are based on the opinions of 10 scouts that he speaks with (correct me if I'm wrong on that, Bob). That seems like a reasonable line in the sand so to following his example, I have done the same thing. 10 scouts, coming from all 6 divisions and both conferences but no NHL team represented more than once. 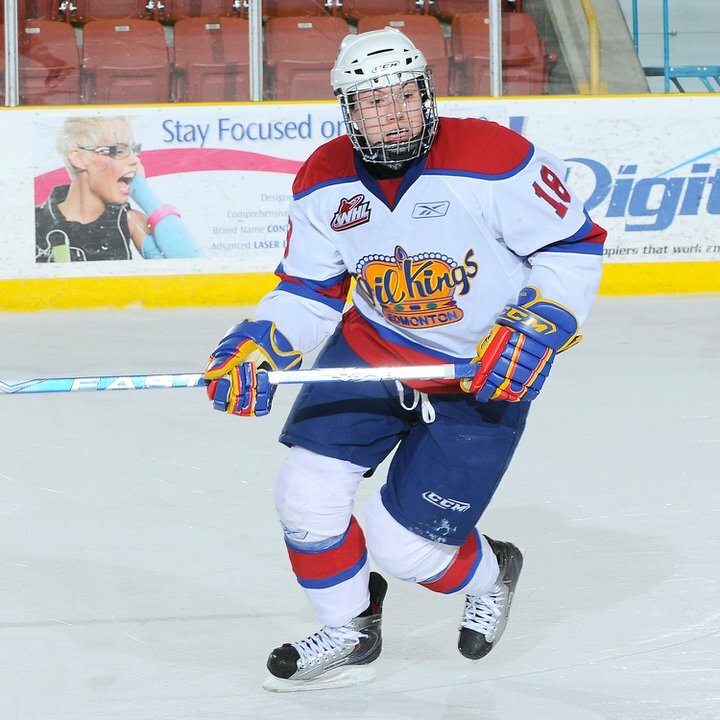 Question #1: Is Edmonton Oil Kings leading scorer Dylan Wruck someone that you would push for in your team meetings as a player to draft? This was another one of those shows that kind of came together late in the week as a player we had lined up had to cancel yesterday and a couple other guests were tough to track down and get confirmations from. In the end, we did what we always do; we talked CHL with one of the best play-by-play guys in the game, looked more at the 2011 NHL Draft, checked in on the NCAA playoffs, talked Calder Trophy and also updated listeners on the CIS playoffs. We are getting reports that Kamloops forward Brendan Ranford was kicked out of the Blazers game tonight with Kelowna for Cross checking a linesman. Midway through the 2nd period, Ranford, a Flyers 2010 draft pick was given a 2 minute slashing penalty and a game misconduct. Last weekend Michigan State Head Coach Rick Comley coached his last game for the Spartans as Comley is leaving (or was asked to step down depending on who you talk to) after this season. 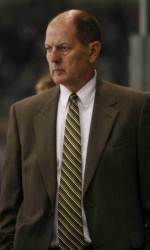 Tonight word coming down that Tim Army is giving up his bench boss duties with the Providence Friars. The official release can be found here. 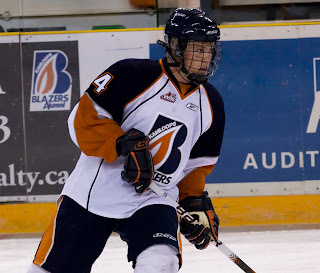 Continuing with Chapter 5 of his guest blogging series with us is Dylan Willick, forward of the Kamloops Blazers. The native of Prince George, B.C. submitted his first entry to the blog back on November 1st with Part 2 arriving at the end of November. Part 3 came early in 2011. On February we were treated to the 4th installment. Since then, Willick's career year has seen him continue to produce points and further cement his reputation as a character/ leader for the Blazers. With the 2011 NHL Draft now just 3 months away, I know that teams are taking note of what the previously un-ranked (by NHL Central Scouting) forward has to offer. Oil Kings Clinch, Lose Massive Supporter, and relive the past. I didn't know Vic Mah very well but from what I've read and from what others have told me, he was a major part of the hockey scene in Edmonton. Tonight on TPS we doubled dipped our 2011 draft segment, went across the CHL and tried to get to the bottom of the Rick Comley fan incident that took place in Alaska over the weekend. One thing is for certain; the IQ of the Oilers organization just skyrocketed. 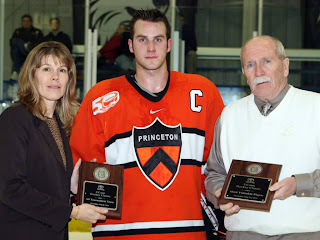 Edmonton announced earlier today that they have signed Princeton Tigers captain Taylor Fedun to a 2-year entry level contract. 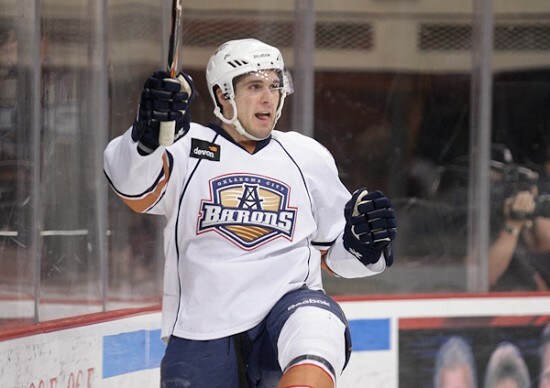 The local product just finished his 4-year tour of duty in the NCAA and is en route to Oklahoma City where he will join the AHL's Barons for the rest of the season and playoffs. Here is the official release from the Oilers and from Princeton. 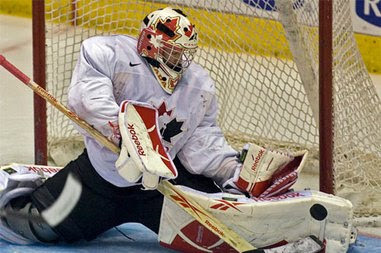 The 2011 World U18 will be held in Dresden Germany beginning on April 9th. As always, that start time means Canada will be severely shorthanded as most of their best players will still be playing in the CHL playoffs. That will also affect some European teams as they may have two or three players overseas in the same situation. Team USA, however, is hardly affected at all since the vast majority of the team that will head to Germany next month will consist of the U18/U17 program out of Ann Arbor. There may be a player added from outside that mix, perhaps two like last year when Austin Watson (Peterborough, OHL) and Connor Brickley (Des Moines, USHL) were added. It's not a coincidence that USA has had their way at the event over the last several years because of this. Canada will enter a team made up of players who failed to reach the post season in the CHL or were eliminated quickly in the first round. They will be able to draw from some of Jr.A teams and NCAA clubs too. With the Frozen Four ending ending on April 9th, that may be cutting it too close for the two teams in the Finals but, for the purpose of today's list, let's assume it's not. We'll also go by the WHL standings as of today - things may change but the team outside of the playoffs and therefore available for Hockey Canada are: Calgary, Regina, Swift Current, Lethbridge, Kamloops and Seattle. Also keeping in mind that players must be born in 1993 or more recently. Rich Preston: "Loses His Temper"
Last night's game between Lethbridge and Kelowna was highlighted by a 3rd period incident centering around 'Canes head coach Rich Preston. 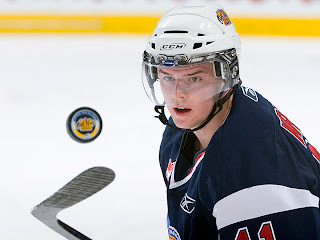 The play-by-play voices from both teams have done a great job of painting the picture on their blogs so instead of me recapping the scene, here is the Lethbridge and Kelowna perspectives. 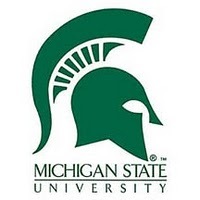 Last night the Michigan State Spartans played their final game of the year as they were bounced from the CCHA conference playoffs by the Alaska Nanooks. The game went to overtime for the second consecutive night and ended the same way it did Friday, with a goal from sophomore Nik Yaremchuk. Yesterday Dean broke the story about Spartans head coach Rick Comley getting into a postgame altercation on Friday night. Local Fairbanks media has since picked up the story. Halfway through our 'Game Day' edition of The Pipeline Show this morning we received word that there allegedly was a post game incident involving Michigan State Head Coach Rick Comley and some Alaska fans last night. 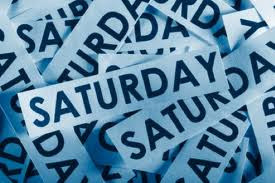 Saturday's guest list was a bit of a moving target as one intended participant had to drop out and another forgot he was getting on a plane before his segment. But being the professionals we are, we improvised and pulled out another solid show. We covered the CHL and NCAA action from Friday night, talked about the Taylor Hall fight/injury and how that might impact the Calder Trophy race, went East to look closer at the Quebec Remparts, covered some NCAA stuff and looked ahead to the World U18s for Canada. The Pipeline Show has learned that Prince George Cougars defenceman Sena Acolatse has been signed by the San Jose Sharks. The 20-year-old is in his final season in the WHL and has earned the 3-year entry level contract with his performance for the Cougars. 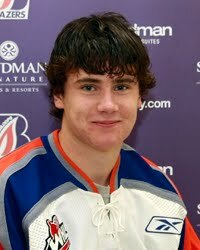 Continuing his guest blogging series with us today is Travis Ewanyk, forward of the Edmonton Oil Kings. The product of St.Albert, AB wrote the first entry to the blog back in October and followed that up with Part 2 in December. Since then the Oil Kings have improved their team play and climbed the standings to 6th place in the WHL's Eastern Conference. Wednesday night at Rexall Place the Edmonton Oil Kings jumped out to a 4-2 lead over the top team in the WHL after 20 minutes of play. I'm sure Saskatoon head coach Loren Molleken peeled some paint in the first intermission and it worked. The Blades outscored Edmonton 6-1 in the final 40 minutes to pick up their 49th win of the season. Tuesday night we were joined by the most talked about prospect leading up to the NHL trade deadline, a Michigan Wolverine/"love expert"/Ottawa Senator, a Top (Sea) Dog for the NHL draft and our CHL insider from Rogers Sportsnet. Tonight on TPS we'll be joined by Michigan Wolverine Louie Caporusso, an Ottawa Senators draft pick, and a guy who was front and centre on Valentines day. 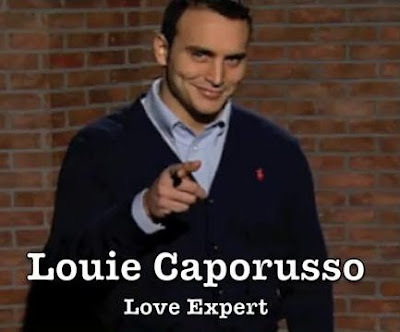 Louie is set to join us at 7:45 pm mst. 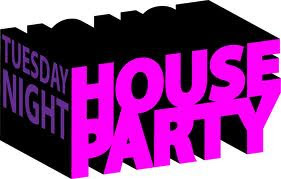 Check out the video below... it's well worth your 56 seconds.